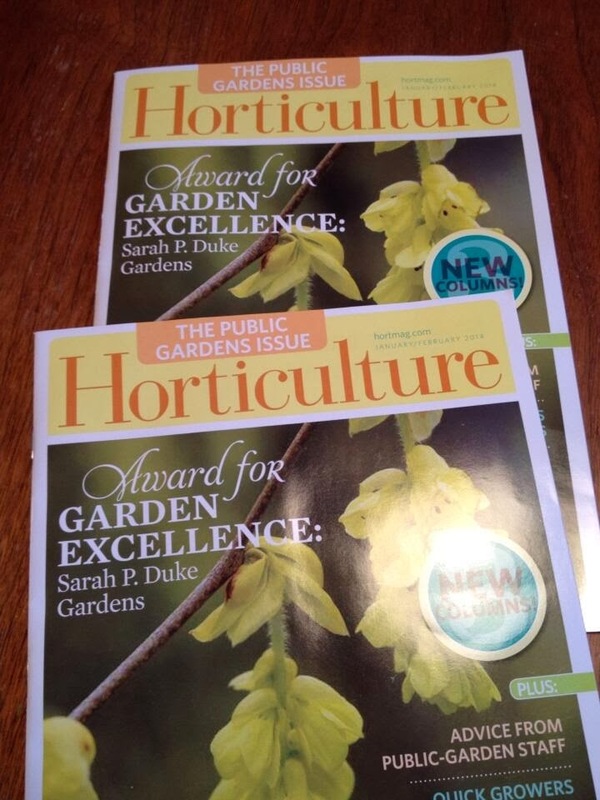 Niki Jabbour - The Year Round Veggie Gardener: Interplanting fun! I must admit, I'm a bit of an obsessive interplanter. It's funny how quickly a 2000 sq foot garden can feel rather cramped and I find combining 2 or more veggies/herbs in the same garden bed allows me to get a greater harvest out of the same amount of space. There are many ways to interplant. I combine plants with different growth habits (upright and spreading), nutrient needs (heavy and light feeders), light requirements (full sun and partial shade), growth rate (quick and slow) and so on. In the photo at left is a classic interplanting combination - radishes and carrots. Carrots are extremely slow to germinate and grow, but radishes can sprout in as little as 2 days! Therefore, planting them together will mark the row for the slower growing carrots and by the time you're ready to harvest the radishes - in about 3 weeks - the carrots will just begin to need that space. 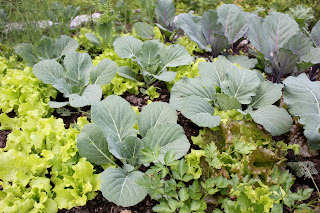 I also love to interplant salad greens - mesclun mix, lettuce blends, leaf lettuce, spinach, baby chard and more - in between my brassicas (cabbage, broccoli, kohlrabi, kale). 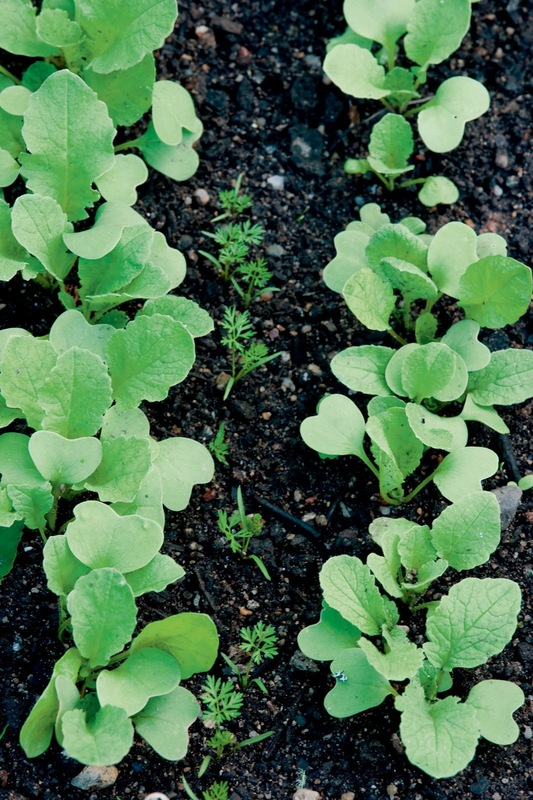 The low growing salad crops form a living mulch on the soil surface which helps prevent weed growth and water evaporation. Plus, it looks extremely ornamental! Check out the image below of my cabbages and leaf lettuces. Another fun way to interplant is to use the shelter provided by taller crops, like pole beans to protect cool season crops from the summer sun. Under our A-frame trellises and pole bean teepees, I like to plant crops like arugula, spinach and pak choi, which typically would rather grow in spring, fall (in the garden) and winter (in a cold frame). The shade from the pole beans (or climbing cukes, gourds, peas, etc) is just enough to allow my cool weather veggies to thrive - even in July and August! Some other combo's that I've had success with include beets and Japanese turnips between my broccoli, broccoli raab between my celeriac and celery plants, spring salad greens between my young tomato seedlings, soybeans between my leeks and pole beans climbing up my corn. So many possibilities for interplanting! What are some of your favourite combo's?? Thank you for the great combination ideas. Actually, I like to interplant marigolds and other flowers with veggies - both for looks and to offer some protection from pests! 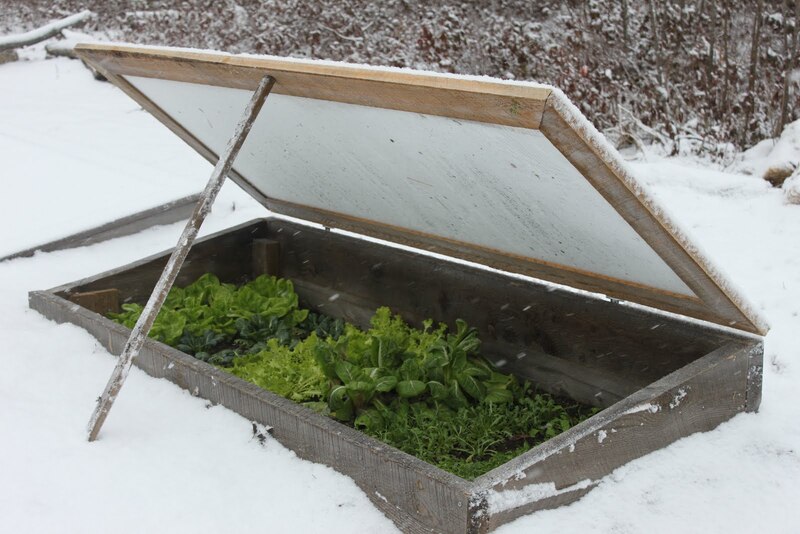 I have been an Urban gardener since I worked on the NFB short "My Urban Garden" in the early 80's -but last year was so bad I'm looking for new ideas -like a cold frame , soon! i'm going to try the Lee valley Heat activated Window opener with a storm window. What angle is steep enough to let snow slide off? Do you decide on what to grow in terms of Nitrite/ light relationship? Really great questions! As for snow shedding, you would need to go very steep to self-shed snow. I typically go out with a broom or plastic shovel and push any accumulation off my cold frames. 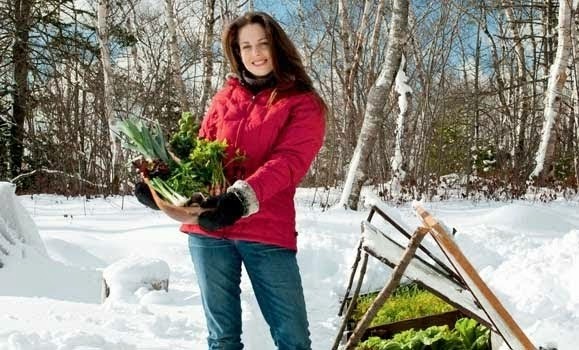 It would also depend where you are located and where your cold frames are located on your property - some spots seem to trap snow. With nitrate, that is an issue in heated winter greenhouses that try to grow crops out of season with little winter light. 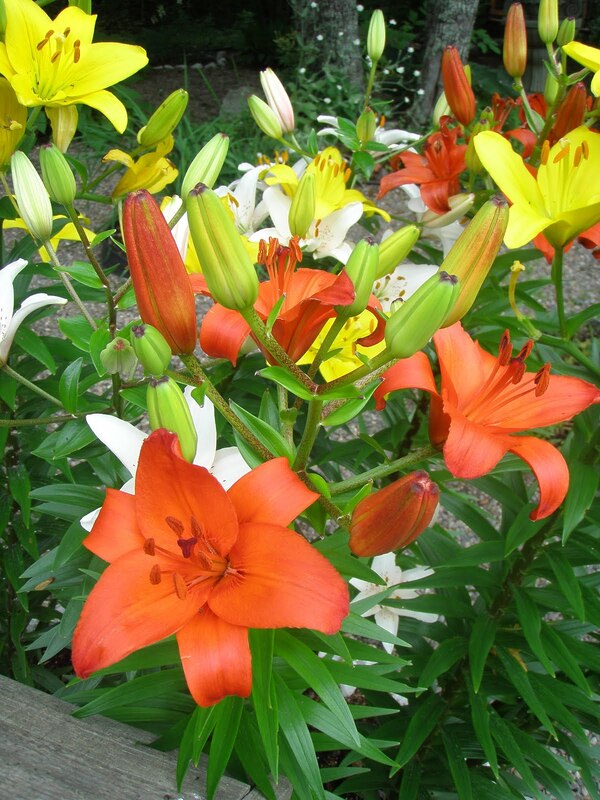 To help encourage quick growth, they apply liquid N fertilizers, often synthetic ones. In a cold frame, this isn't an issue. I avoid amending my soil with fresh compost (which is obviously not good for your crops/garden anyway! ), but nitrate build up is not a problem. I hope that helps! Good luck and keep me posted..
Niki: there is no follow button at the top of the screen. I would like to subscribe to your blog. Ever tried 3 sisters planting? Corn, beans and squash? I think I'm going to try it this year. Thanks a million -no- a billion!!!!!!! I have searched web wide for info on planting spinach under A-frame with pole beans. Tomorrow (middle of June in Central Virginia) I am going to plant spinach under my "A" frame pole beans!! I might even plant spinach under the "A" frame for winter squash!! I am looking for a photo to illustrate interplanting for a presentation. What are the terms for using the photo on this page? Hi and thanks for asking - that is appreciated. Can you please e-mail me at nikijabbour@hotmail.com a few sentences on you and your presentation.. where, when, topic? I usually just ask for the link to my blog or website (www.nikijabbour.com) to be added to the slide in readable font so that attendees can then find me online.